Do you need to check if a specific surface is flat? If the answer is yes, you have to download Best Level application. Best Level functioning the same as its real physical equivalent (also known as libella, spirit level or bubble level). Using it you can easily check if the measured surface is truly flat. 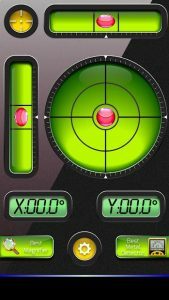 Best Level beside the classical measure level contains the calibration option and the bull’s eye level (also known as circular bubble). It measures the level simultaneously in two dimensions – horizontal and vertical. If measured surface is flat, the ball shown on screen will became red. If surface is unlevel, the ball will remain gray and will be situated outside the center of viewfinder. You can use this app to measure the elevation, roof, shelf – any inclination. It uses accelerometer to help you test (almost) any object for plumb/level. Application can be used by carpenters, stonemasons, bricklayers and other building trades workers, surveyors and metalworkers. An inclinometer or clinometer is an instrument for measuring angles of slope (or tilt), elevation or inclination of an object with respect to gravity. It is also known as gradient meter, gradiometer, level gauge, level meter, declinometer, and pitch & roll indicator. Simply wonderful. Some days I need not take my distance measure or laveler with me. The world is truly being put at our finger tip. The perfect tool for me just now. I’m building my house and this is just great to check if the walls and floors are level. It works.